Crane bins provide a method of collecting, storing, recycling and transporting various wastes around and off your job via crane. 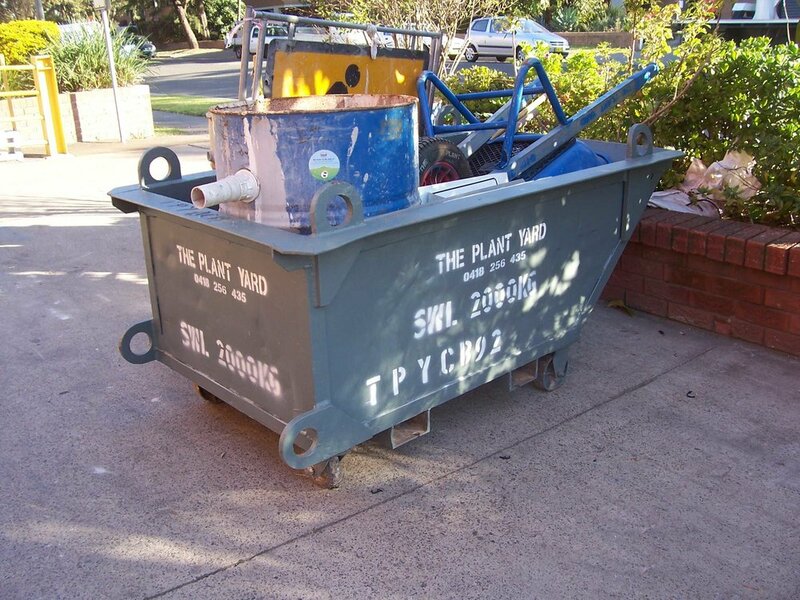 Whether its demolition waste, concrete wash out slurry, hazardous materials, green waste, recycling or general waste, crane bins are a vital tool in establishing an environmentally efficient and cost-effective construction waste management plan. 3. Minimise the amount of material sent to landfill. The first step in a construction waste management plan is to identify the specific types of waste materials your site will be producing. This can include timber, wood waste (e.g. MDF, plywood), cardboard ferrous metals (e.g. iron, steel), nonferrous metal (e.g. copper wiring), concrete roofing tiles, ceramic tiles, gravel, gypsum board (e.g. drywall), plaster, paint, plumbing fixtures and fittings, carpet and underlay, stone, asphalt, glass sand/fill topsoil, green waste, asbestos (maybe present in older building undergoing renovation/extensions), fluorescent light tubes, hazardous materials (e.g. excess paint, solvents), plastics PVC, co-mingled recyclables (e.g. paper, cans, glass and plastic bottles, cardboard) from workers, general waste (e.g. food waste, contaminated food packaging, non-recyclable plastics) from workers and mixed waste. Being able to identify the different types of waste on site prior to works assists in establishing a waste management system on site. This system should include separate bins for separate types of materials and should also incorporate bin placement onsite for easy and safe access. It will also assist if staff are educated on the waste management system and how to implement it. The ability to keep wastes separate in large crane bins will save money when it comes to landfill charges. For example, landfill receptors often provide an incentive for high recycling rates of massive materials, such as masonry materials (asphalt, bricks and concrete). However, if these materials are not separated, they will not take it. Also reclamation is popular for high-value materials, such as metals and hardwood timbers in which can be sold after your jobs completion. Our crane bins suitable for this style of works range from smaller forklift waste tipping bins, 1000kg to 5000kg crane bins and our large self tipping crane bins. 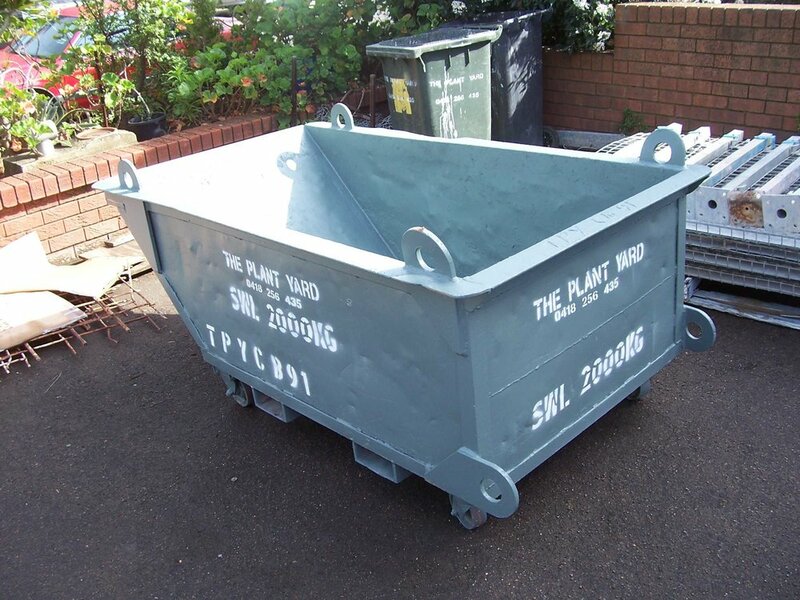 If you would like to hire one of our bins or request a quote. Please contact us on theplantyard@theplantyard.com.au or call us on +61418256435. Take a look at some of our crane bins available for hire below.